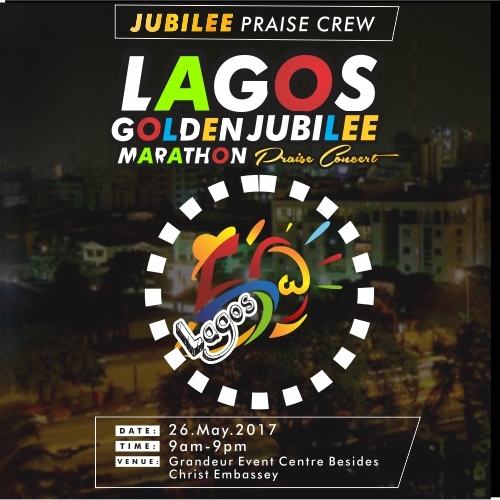 The Jubilee Praise Crew has put together a 12 hours praise concert tagged “Lagos Golden Jubilee Marathon Praise Concert” in celebration of Lagos state Jubilee celebration. Its no longer a news to all residents of Lagos state that the state is celebrating her 50th year since creation in 1967, and as a way of thanksgiving to God, The Lagos Jubilee Praise Concert has been put together and is expected to feature some of Lagos finest gospel ministers. Artistes such as Evangelist Ebenezer Obey, King Sunny Ade, Tosin Alao , Ibitayo Jeje, Tosin Bee, Odunayo Aboderin, Titilayo Euba, Adesanmi Michael, Bukola Bekes, Efe Nathan, Beejay Sax, Bidemi Olaoba, Femi Okunuga, Stephen Uwaifo, Ayan Jesu, Pastor Kunle Ajayi, just to mention a few. Follow @jubileepraizcrw on twitter and Instagram. #LagosJubileePraise for update on social media.